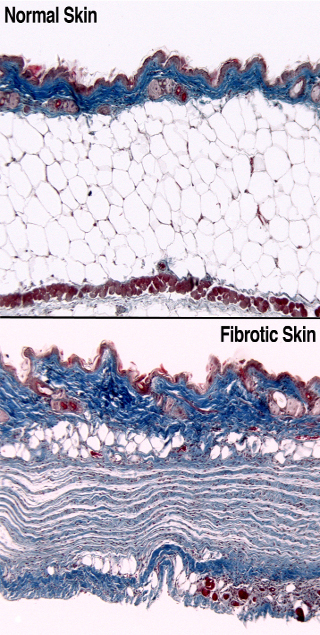 Fibrosis is a process associated with chronic inflammation where collagen produced by activated myofibroblasts permanently scars tissues and leads to organ dysfunction. Every organ system can be damaged by fibrosis, which contributes to diseases such as autoimmunity, atherosclerosis, and all types of organ failure. It is well known that inflammatory cells secrete platelet-derived growth factor (PDGF) and fibroblasts and mural cells express PDGF receptors (PDGFRs), but how this signaling system regulates fibrosis has been unclear. We have recently demonstrated that PDGFRα signaling causes fibrosis in the skin and many other organs in mice (Olson & Soriano 2009). Going forward, we are specifically focusing on how PDGFRα signaling alters the wound-repair process to create scar tissue. We hypothesize that PDGFRα signaling drives fibrosis by 1) cell-autonomously directing the balance of progenitor cell differentiation towards a fibroblast/myofibroblast fate or 2) inducing secondary signals that act in a paracrine fashion to regulate fibroblast/myofibroblast biology. We are developing new mouse models to label mutant cell clones with a fluorescent reporter, which will allow us to track the fates of PDGFRα-mutant cells during fibrosis and wound repair. It will also be useful for isolating cells at any stage of disease for detailed characterization of cell surface markers and gene expression.